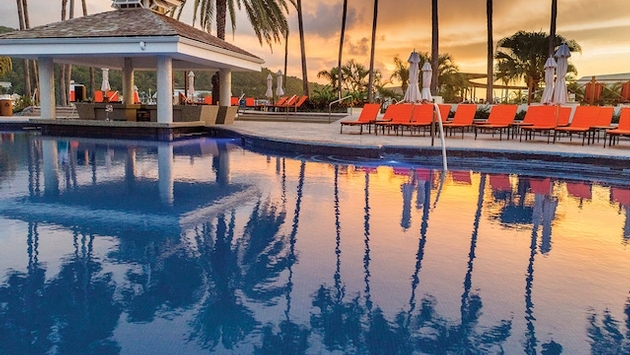 2015, Palace Resorts debuted the Jamaica Sunset Grande in Ocho Rios. All-inclusive resorts have been around for more than 30 years in some form or another, but not all of the brands that have emerged in that time can be said to be truly innovative. A case in point is Palace Resorts, which has successfully combined premium accommodations with deluxe amenities, facilities and services – plus an emphasis on A-list entertainment and a full menu of resort activities. Palace Resorts properties have also “raised the standard” on food-and-beverage offerings, said Halpern, offering guests “top-shelf alcohol and luxury dining throughout the resort,” plus 24-hour daily room service. Additionally, Palace distinguishes itself on the entertainment front with performances by top-shelf international entertainers. “We’ve had top-notch performances featuring incredible acts such as Shaggy, Usher, Ricky Martin, OMI, Enrique Iglesias, Gloria Gaynor, and Kool and the Gang,” Halpern said, adding that Duran Duran closed out 2016 with a concert at the Moon Palace Arena, with The Cranberries scheduled to perform there this year. In other developments, the Grand at Moon Palace Cancun, a resort-within-a-resort located within the Moon Palace Cancun complex, is undergoing a $450 million renovation, designed to elevate it to the “highest possible luxury standards,” said Halpern. The revamped property will offer travelers more than 1,300 guestrooms; an expanded lobby; nine outdoor swimming pools, including an adults-only pool with a live DJ; five swim-up bars; a beach club; a waterpark; and a bowling alley. The Grand at Moon Palace Cancun will also offer guests eight dining options, including Asian, French, Lebanese and Mexican fare, and family-friendly facilities including The Playroom for younger kids, and a teen lounge featuring video games and a giant concession stand. Additionally, the resort will offer the Awe Spa, a new 76,875-square-foot facility featuring more than 60 spa suites, a hydrotherapy circuit, plunge pools, and steam and sauna rooms. In 2015, Palace Resorts extended its brand to Jamaica with a new property that replaced the Jamaica Sunset Grande in Ocho Rios following a multimillion-dollar construction project. 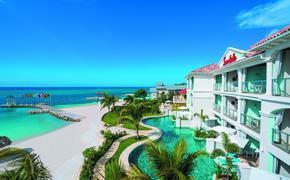 “Moon Palace Jamaica Grande has been a great addition to the Palace Resorts portfolio,” said Halpern. “Not only is Jamaica a well-known destination, but a great place to invest in. As this was an iconic property in Ocho Rios, it has been well received by all guests staying at the resort,” she said. And like other Palace properties, top-shelf entertainment is a standard at the Moon Palace Jamaica Grande. Performers have already included OMI & Shaggy. On Feb. 24, Survivor will entertain guests at the resort’s Grand Ballroom. On April 1, Jamaican entertainer Sean Paul is scheduled to take the stage. Palace Resorts views travel agents as “key players in the industry” who provide extraordinary value to both hotel companies and their own clients, said Kathy Halpern, the company’s vice president of sales and marketing. The company relies on travel agents to sell its Mexico and Jamaica resorts and provides tools, programs and services to help them maximize their sales. “We have Pro Specialist Agent, an exclusive program that educates travel agents and provides personalized informative support,” said Frank Corzo, vice president of field sales. Palace also offers agents an array of other educational platforms, including the Palace Experience Global Conference, a three-day forum enabling travel advisors to immerse themselves in educational seminars and sales-driven workshops, and participate in team-building activities sponsored by the company’s philanthropic organization, the Palace Foundation. A version of this article appears in print in the February 2017 issue of Vacation Agent Magazine.